RESEARCH findings from NSW DPI indicate an alarming failure to boost fish stocks in the years following the 2013 Mulloway Recovery Program. Figures suggest a controversial commercial fishing rule has allowed netters to target and sell substantial numbers of undersize mulloway. As a result, stocks of this valuable sport fish remain at critically low levels. The current rules allow commercial estuary mesh netters to keep 10 undersized (45-70cm) mulloway per day, plus all they net over 70cm. The 10 fish limit was originally introduced as a method to minimise “waste” on unwanted by-catch. DPI’s research data, however, shows a significant percentage of the annual mulloway catch falls into this “undersize” category. This appears to indicate commercial netters are deliberately targeting juvenile fish, rather than just keeping a small number of accidental by-catch. Furthermore, DPI figures also reveal 25 per cent of samples commercial catches had in excess of 10 fish, some netters selling many more than legally allowed. One operator reportedly sold more than 100 undersize fish in a single day. Altogether, this equates to about 70 per cent of commercial mulloway catch from estuary General Fishery being undersized fish which have never had the chance to breed. This equates to about 55 tonne of undersize fish, or about 37,000 individual mulloway weighing 1.5 kilos each annually being taken for the commercial market as a result of the “legal loophole” provided to commercial netters. ABOVE: The number of 45 cm to 70 cm mulloway (blue) and greater than 70 cm mulloway (black) in each of the 417 mesh net catches monitored since implementation of the mulloway recovery program. The catches have been sorted from highest to lowest in terms of numbers of fish. The goal of the Mulloway Recovery Program in 2013 was to increase spawning stock of mulloway by “reducing fishing mortality on both adult and juvenile parts of the stock,” according to NSW DPI. 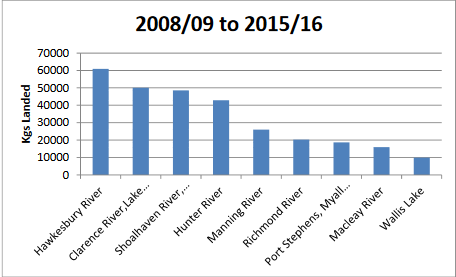 The DPI data also reveal the huge numbers of mulloway being removed by commercial netters from NSW river systems. The Hawkesbury, just north of Sydney, leads the pack with about 60,000 kilos of mulloway netted between 2008/09 to 2015/16. This is followed by 50,000 kilos from the Clarence and about 48,000 kilos from the Shoalhaven. The Hunter, Manning, Richmond and Macleay rivers also record large commercial catches of mulloway, ranging from just over 40,000 kilos for the Hunter, 25,000 kilos for the Manning, 20,000 for the Richmond and about 15,000 kilos for the Macleay. Many of these systems are key recreational fishing tourism areas. Major commercial estuaries for mulloway landings 2008/09 onwards. While the numbers of juvenile mulloway being removed by commercial netting operations is alarming, the fact remains that recreational fishing also accounts for large numbers of mulloway being caught. DPI estimates that the recreational sector took about 102 tonnes of mulloway during the 2013-14 period. The good news for the recreational score is that the minus length increase from 45cm to 70cm has resulted in reduced mortality on juvenile fish, according to DPI data. Recreational bag limits for mulloway were also reduced from 5 to 2 fish as part of the recovery program. It is understood this has also had beneficial impacts on fish stocks. However, rec anglers can still “take” 2 adult fish per day, meaning that this aspect of the rule changes has done little to reduce mortality on adult fish. Further recreational rule changes potentially involving a bag size reduction to 1 fish per day or a daily limit of 1 fish over 1m could be management methods that could further reduce our impact on stocks of these prized sport fish. DPI research showed a significant increase in rec released mulloway (89 per cent) after the 2013 Recovery Program was announced. It also showed a high likelihood of fish surviving after release. NSW DPI's research since the 2013 Mulloway Recovery Program show drastic changes are required to protect this valuable recreational and commercial species. Consensus would suggest eliminating the 10 undersize fish rule is essential to grow stock to acceptable levels. Recreational fishers, as mentioned above, may also face changes with a potential redcued bag limit or slot limit. In Fishing World's opinion, moves like this combined with necessary changes to the way the commerical mulloway fishery is managed seems fair if we're to continue to be able to target and catch these valuable sport fish in the future. DPI's review of the mulloway recovery program changes October 2016 is available here.